Performance and presentation has become such a prominent part of public life now, that reality has become subjective. ‘Constructed reality’, as a phrase, is relatively new and didn’t exist at the time of the scandal of the “coughing major”, the events of which form the backbone to James Graham’s newest West End play, “Quiz”. But even though the phrase had yet to be coined, the trial of Charles and Diana Ingram accused of cheating on ITV’s ‘Who Wants to Be a Millionaire?’ was still described by those who were there as ‘pure theatre’. Graham’s stunning play truly reflects this. It is a whirlwind account of the drama that unfolded in both the courtrooms and the television studios, brilliantly highlighting the fact that the two are becoming more and more indistinguishable. The production, directed by Daniel Evans, is inspired and ingeniously constructed, using knockabout comedy to pinpoint the harsh truths of the false world we find ourselves living in. Robert Jones’ set combines the courtroom and the game show as cleverly as Graham’s writing, and even the audience are given a handheld device to pass judgement on the accused. It’s 50:50 – guilty or not guilty. As simple as that. Although it isn’t quite so simple. We get to decide twice: at the interval and at the very end, and each time the verdict is different. The first act concentrates on the prosecution while the second act presents the same set of events from a different camera angle, inviting – or perhaps cajoling – us into rooting for the Ingrams. It is a disquietingly manipulative device, but we accept it. The multi-tasking cast feast on their roles, relishing the vibrant array of characters they are depicting; from QC to Quizmaster (Keir Charles, for one, hilariously and perfectly capturing the tones and mannerisms of Chris Tarrant); contestant to conspirator, police officer to army general, among many others. We are also given a potted history of light entertainment, and how ‘Who Wants to Be a Millionaire?’, in particular, morphed into a global phenomenon. Far from being expositional it is all quite eye-opening. But the focal point is the question mark that hangs over Charles Ingram winning the million-pound jackpot. We all know the historical reality of the guilty verdict but Gavin Spokes, as Charles Ingram, has to make us believe in him. And the beauty of his performance allows us to do just that. Assisted by Sarah Woodward’s impassioned defence lawyer, we are driven to reject the reality and overturn the judgement. We are asked to choose a “more entertaining lie over a less extraordinary truth”. But all the time we are reminded that this is theatre. As thought provoking as it is, it is utterly entertaining, insightful and immersive. It is a compelling presentation, full of sleight of hand that is often as manipulative as the subject matter itself, constantly toying with our perceptions of truth. But amid the mire of differing perspectives, one verdict is absolutely clear – “Quiz” is a sure-fire hit. 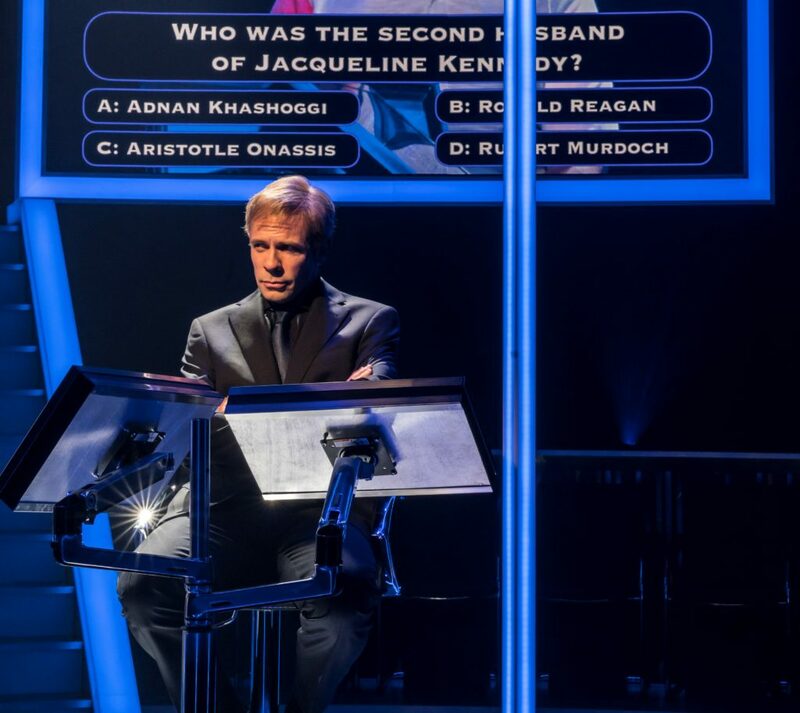 Quiz is based on the scandal surrounding the TV show, Who Wants To Be A Millionaire? For those who don’t know about it, what happened? This scandal was so monumental a lot of people can recollect whereabouts they were when it happened in 2001. What was going on in your life at that point? I was living just off Portobello Road at the time, succeeding superlatively at being an unemployed actor. How relevant is the story now do you think? Extremely relevant, it investigates the phenomena of ‘fake news’ which is hugely apposite. You play Chris Tarrant and other well known faces in the show, do you feel that there’s more pressure portraying a real life person that everyone knows? Is this the first time you have played a real person? I think so … A living one anyway. Did you ever get in touch with Chris Tarrant for any tips or for his side of the story on the turn of events? No, I presumed Mr Tarrant would be far too busy to talk to me! What drew you to being a part of this production in the first place? Simple, the writer James Graham and director Daniel Evans. 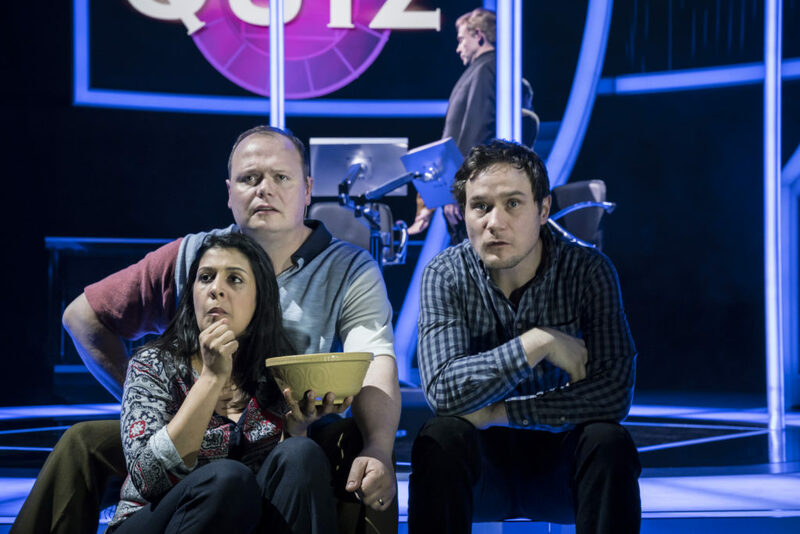 James Graham is probably one of the best political playwrights around, how has he brought those talents to the table with Quiz? In his usual, inimitable way of being intimidatingly clever, endearingly modest and a right laugh. The show features onstage seating, how does it feel to have some of the audience in such close proximity? What’s your own favourite quiz show? Probably University Challenge, I feel incredibly clever if I get just one question right. How well do you think you would do as a contestant on a quiz show? In my head I’d be fantastic, in reality I’d be abysmal. Quiz has a limited twelve week run at the Noël Coward Theatre, what are your plans after the production? I shall be back to focusing hard on my exemplary career as an unemployed actor.